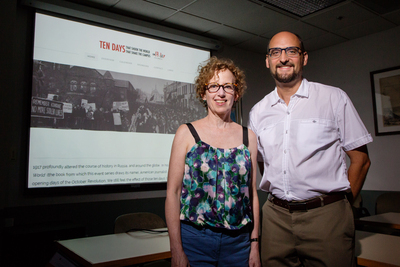 Professors Harriet Murav and David Cooper have played significant roles in organizing a fall semester series of campus events on the Russian Revolution, marking its 100th anniversary this year. Illinois is an obvious site for such a series, they note, given its leading role in Russian and Slavic studies. CHAMPAIGN, Ill. — One hundred years ago, the Russian Revolution “shook the world,” in the words of a famous book. Many other schools have organized programs around the centennial, but the U. of I. is an obvious site as “one of the strongest centers” of Russian and Slavic studies in the country and the world, said Harriet Murav, a professor of Slavic languages and literatures, and the coordinator of the fall series. The other exhibit, on the first floor of the Main Library, 1408 W. Gregory Drive, Urbana, will be a display of archival materials drawn from the University Library’s extensive collections related to the Russian Revolution and its legacy. To reach Harriet Murav, call 217-721-9282; email hlmurav@illinois.edu. To reach David Cooper, call 217-244-4666; email dlcoop@illinois.edu.